Wayne McDonald said Coach Falk won because he understood the science of the game rather than the art of the game. 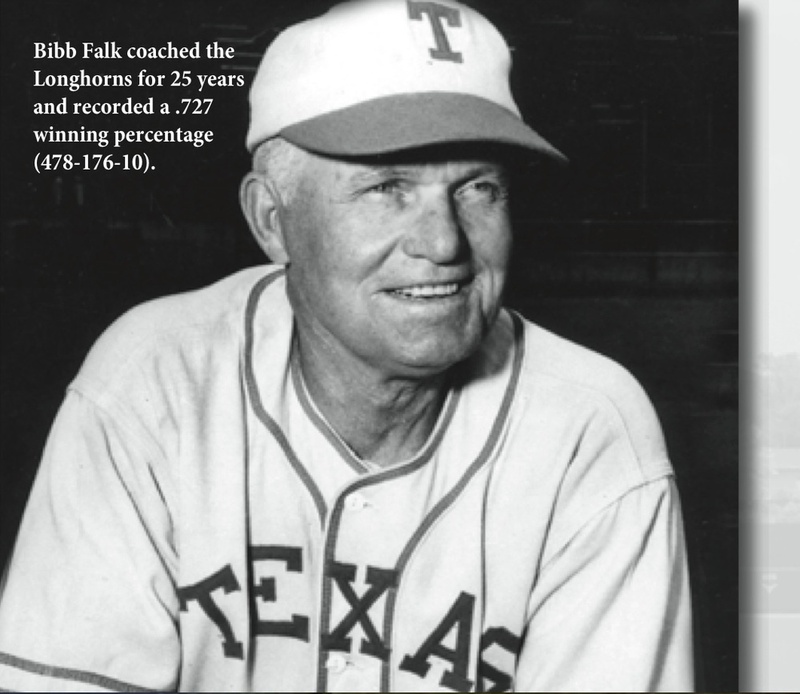 1939 Coach Disch last year - Bibb Falk continues to build on the Disch Legacy. The team goes undefeated for the first time in 20 years . Falk played football at Texas in the 1920's and was All-Southwest Conference. In 1924 he finished 2nd to Babe Ruth for the hitting crown and he was a great outfielder making only 3 errors . 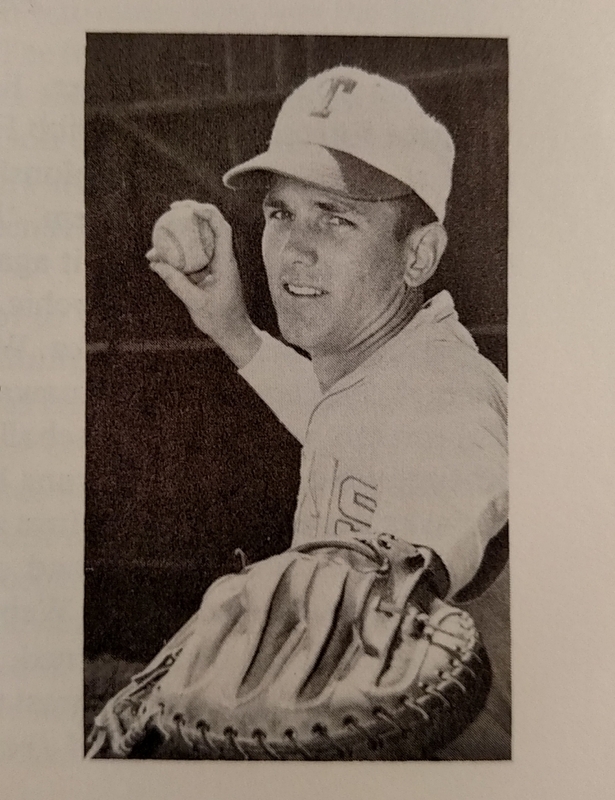 He is a member of the American Baseball Coaches Association Hall of Fame, and he is an inductee into the Texas Hall of Honor. Bobby Moers is an All-American in basketball, All-SWC in baseball, and a football letterman. He receives an award from the Texas student body as the outstanding Texas athlete in 1940. Longhorns are only one game up on the Aggies , but the team wins the series at A & M and the SWC. 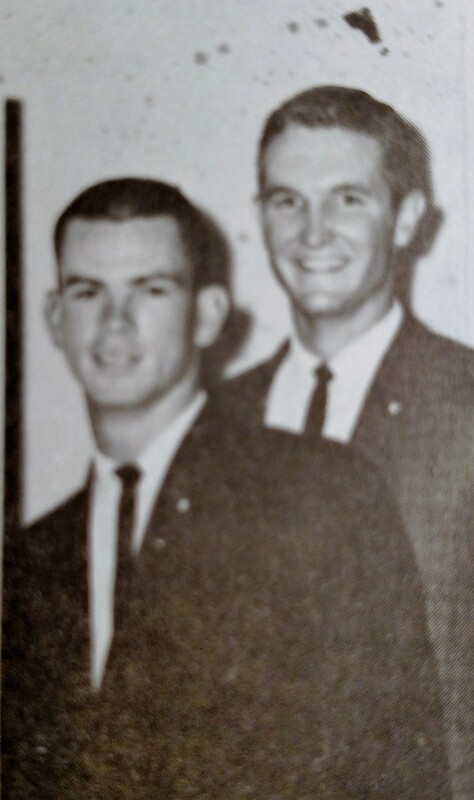 Pete Layden - Falk said that Layden was the most gifted athlete he ever coached. Teams lost heavily to the Armed forces teams, and the SWC was weak due to the war effort. The team was led by Captain Jack Stone . The military draft has a negative impact on recruiting for intercollegiate sports. Coach Falk joins the military service and Blair Cherry takes over as Coach on a temporary basis. 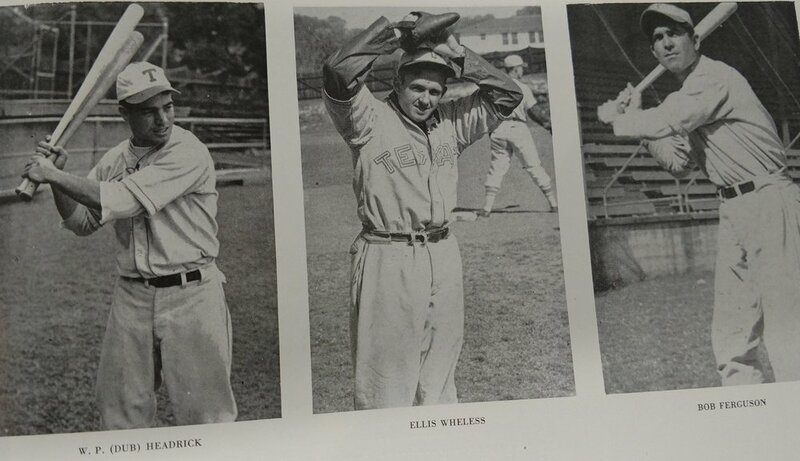 Rooster Andrews is the only starter from the freshman team of 1942 available to play. SMU, TCU, and Baylor decides to temporarily leave the SWC because of the war. Because of the lack of college athletes freshman are declared eligible. Since so many college teams drop sports for the war effort, Texas added military training centers such as Kelly and Rudolph air force base to their schedule. Interest in college sports is at its lowest point in 1944. The Army and Air Force based teams beat the Horns 6 times. Attendance plummets and Texas has its first losing season since 1910. 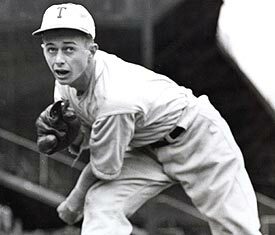 Political incorrect speech, George Raborn a reporter for the Texan described an Aggie pitcher as "looking like a typical sharecropper with hayseed in his hair." Rooster Andrews is chosen as the student manager. Bobby Layne throws two no-hitters. 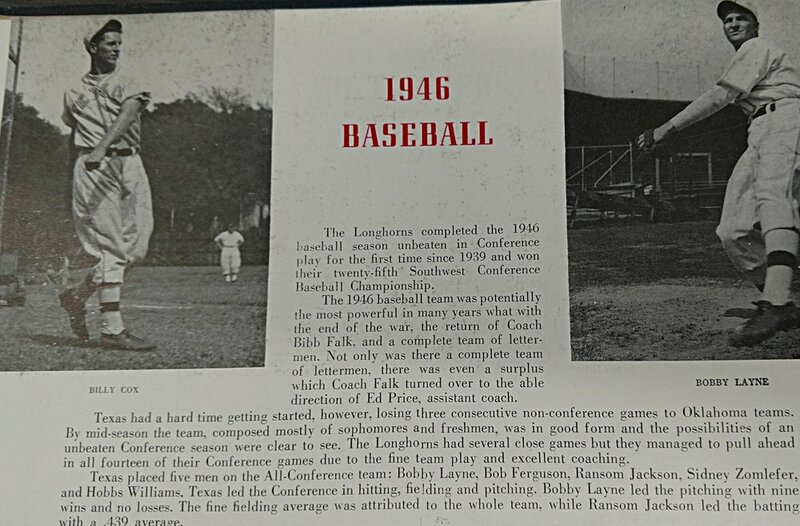 1946 is the last time Longhorn baseball went undefeated in Conference play. 27th SWC Champion out of 33 year history of the league. Texas represents the SWC in the NCAA. Team beat the Sooners but fell to the California Bears in the Western region. Bobby Layne lost his first game of the year. California wina the NCAA championship. Team loses o Brooke Medical Center 5- 3. A record 7,000 fans attend the Baylor game. Bobby Layne holds Baylor to 4 hits and scores the only run of the game. Ransom Jackson wins the batting championship in 1946 (.435) and 1947 (.400). Layne extended his win streak against SWC teams to 22 games. Bobby Layne Sets A Record by defeating 28 SWC Teams As A Pitcher. Bobby Layne is the only player in UT history that was All SWC in both baseball and football for 4 years in a row. The catcher Allen Winter is told during the Ohio State game that his wife delivered their first child. Coach Bibb was in double shock since he did not even know that Winters was married. Team was extended an invitation to play in the NCAA tournament but declined the bid because the team members already had "summer plans". This team chooses not to play in the National Championship tournament due to summer job commitments. The 1946-1948 teams post a 41-2 record in SWC play. Tom Hamilton is an All American and holds the Texas season record for slugging percentage (.878) and batting average of .417. Murray Wall is an All American in 1949 and 1950. Texas record of no losses at Clark Field ends after three years. Bibb Falk predicts the 1950 the Longhorns will be back playing for the National Championship. 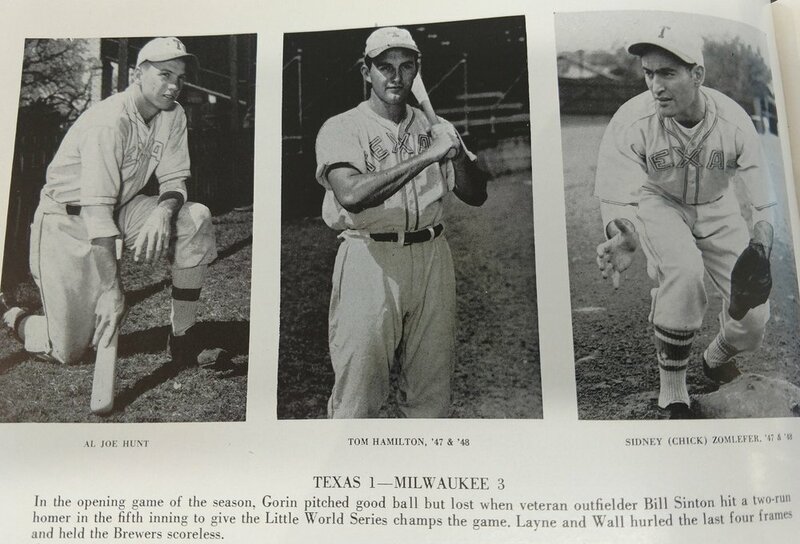 Pitching was the key with Murray Wall, Charlie Gorin, and Jem Ehrler. 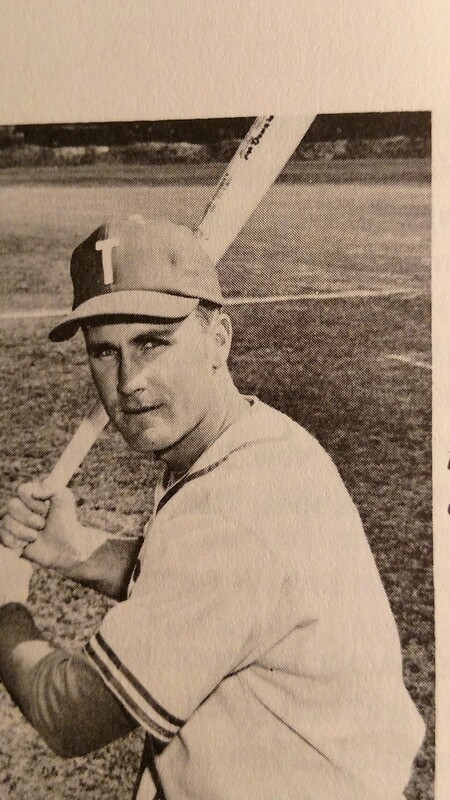 Jim Ehrler was the leader in batting and fielding. National Champions- Only lost one game in conference play. Falk lost several players to the professional league right before the season started. Jim Ehrler pitches the first no hitter ever in the NCAA tournament against Tufts. 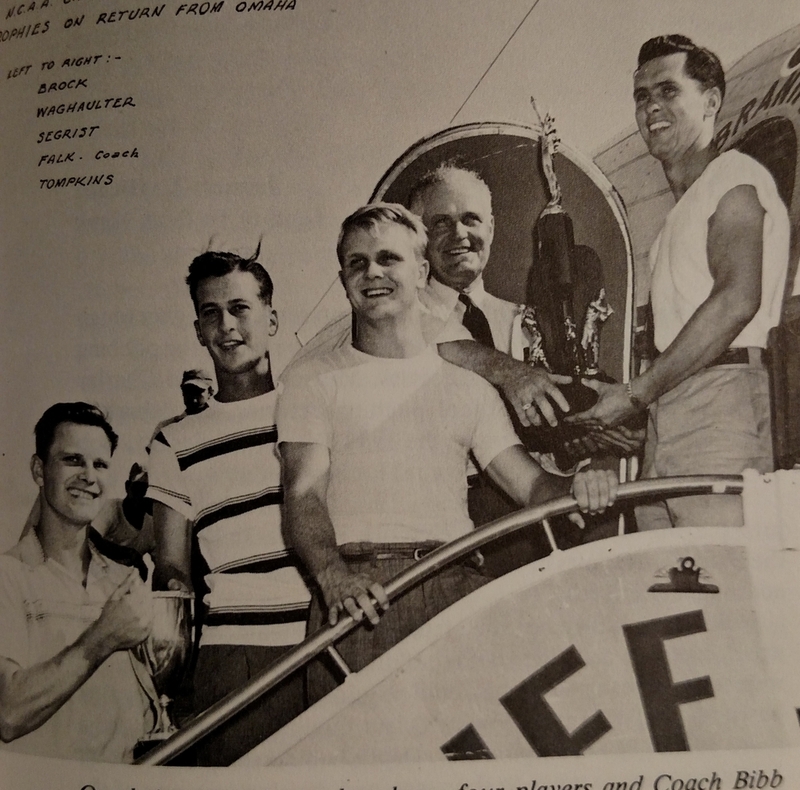 left to right Bob Brock with National Championship trophy, Irv Waghalter, Kal Segrist, Falk, and Ben Tompkins. SWC Co Champions- Team only had three lettermen return. Texas beat Arizona to make it to the NCAA tournament, but lost to Penn State, won against Oregon State, and finally knocked out by Holy Cross. 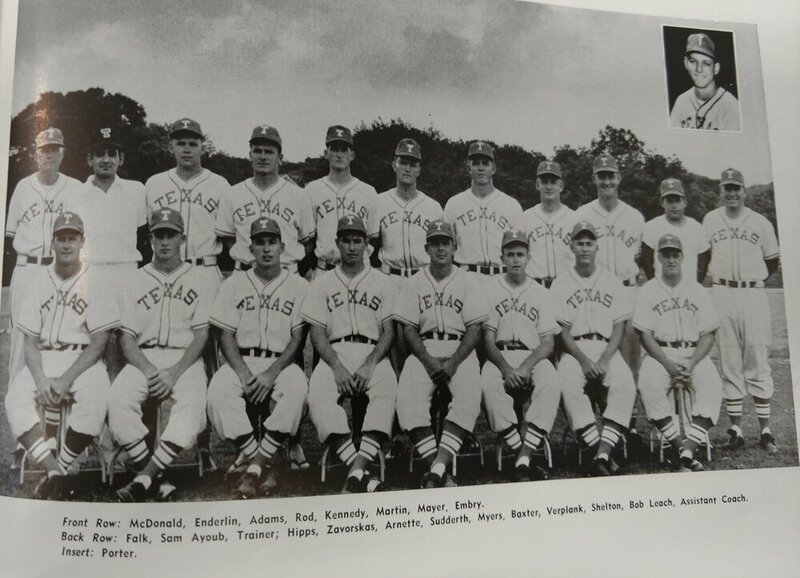 It was the first year in Texas baseball history the Longhorns played only college teams. SWC Co Champion with SMU and finalist in the NCAA. Texas participates in the College World Series appearance for the 3rd time in 4 years. They made the finals but lost to Michigan . J.L. Smith was named the most valuable player in the tournament playing playing 5 of the 6 games as a relief pitcher. Boyd Linker pitched 19 innings without a run scored. In the first 7 years of the NCAA tournament Texas makes 5 appearances. USC was second with 3 appearances. Texas won the SWC on a bizarre game against Waco. The game was called due to darkness and the SWC rules said the game was over and each team got a 1/2 win. The rule was changed the next year so that all games that could affect the SWC title had to be playoff. After 11 years participating in the conference championship, the string was broken in 1955. 6000 fans attend the A & M game, and many fist fights occur between the fans. Even Jack Pardee -the future All pro LA Ram- got in a fight with Buck Lansford who played football for Texas . Texas hits the cellar in the SWC and has the worse year in the history of Longhorn baseball . The only highlights were Harry Taylor set a school record in strike-outs , and George Gainley team batting championship of .360. Team was last in fielding in the SWC and 4th in hitting. 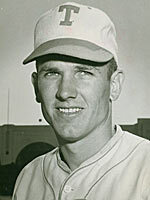 John Woodman leads the team in batting with a .310 average in 1956 and a .413 in 1958. He is All SWC in two years in a row. 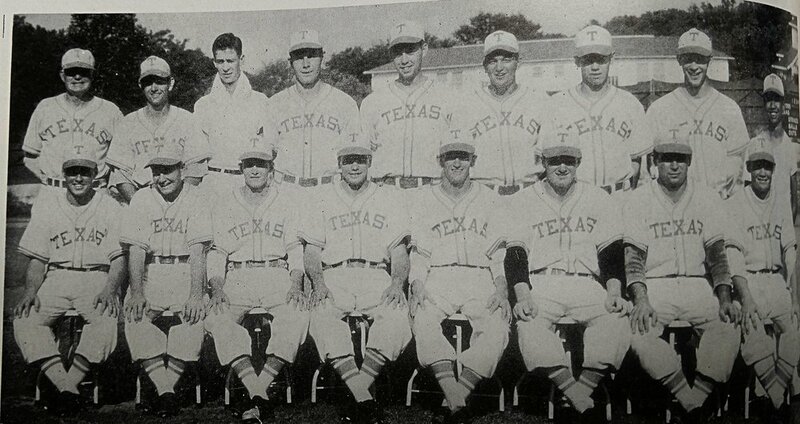 Texas celebrated its 1000th victory in the 61st year of Longhorn baseball. Texas played Arizona for the 5th time in 9 years to determine the team participating in the NCAA tournament. Texas won the first 4 times but lost to Arizona in the playoffs in 1958. This team win 12 in a row before falling a part and losing the final 4 conference games. Aggies won the conference crown. Pete Embry (no picture) was the only longhorn drafted this year. SWC Champion- Team had best record since 1924 but loss to Houston in a sudden death playoff game. 5 players made the All SWC team. Roy Menge was the outstanding player in the SWC and he was named to the All American team. Both Roy and Wayne played professionally. Wayne McDonald leads the team with a .365 batting average. Roy Menge was the outstanding player in the SWC and he was named to the All American team. Both Roy and Wayne played professionally. Baylor is one game behind Texas after winning the first make up game. In the second game in the top of the 6th the game is called due to darkness with the score 9-9. Baylor thinks the remainder of the second game will be played the next day- the day that final exams start at Baylor. What Bibb Falk knew that the Baylor administration forgot is that the league had a rule that stated " games which cannot be played prior to the beginning of final exams shall not be made up and the conference championship shall be determined on the basis of games actually played." Since Texas had a one game lead over Baylor and the tie game was not recorded Texas won the conference. In desperation Baylor considers either delaying their entire exam schedule, moving the game to a lighted field one mile away, or playing the game after exams. Coach Falk response to these suggestions is " I am going to take a shower and get me something to eat and then go home." Baylor had no recourse So Texas wins the conference and eventually qualifies for the NCAA tournament, and the Baylor Coach quits. Longhorns beat Arizona in the District 6 title, but a dismal showing at the NCAA's . The team was two and out losing to USC and Western Michigan. Team started slow but ended fast. SWC champions but they had to work at it. Beat the Aggies with one of the largest come-from-behind victories in Longhorn baseball history. Down 9-2 the Longhorns tied the game 10-10 and then a double by Buddy New and a double by Gary London gave the Longhorns the SWC crown. Texas beat Arizona the number 1 seed in regional play to make the NCAA tournament. The team fought gallantly with the help of three great pitchers- Hartenstein, Myer and Belcher before being eliminated 4- 3 in 10 innings by Santa Clara. Pat Rigby was an All American and voted the most outstanding player in the SWC. He leads the team in batting average (.371). 4 teams could have won the SWC the last week of the SWC baseball season. College World Series Appearance- tied for 3rd. Horns tried to come back after losing to Missouri on an error. They almost did! After going down by 7 runs in the early innings, the Horns fought back but 4 errors cost cost them the game 8-10 and eliminated them from the CWS. Bill Bethea and Butch Thompson are All-Americans. Bill Bethea is a coaching staff member from 1969- 1989. 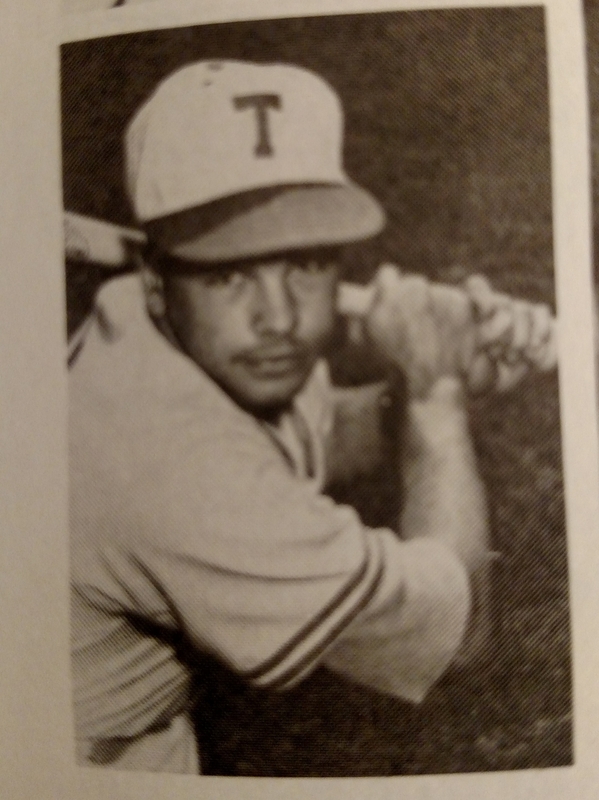 During his tenure UT won 18 SWC championships, attended the NCAA College World series 14 times, and won two National Championships. While other conferences allow fall training and more games, The SWC rules committee did not. While many non-SWC universities honed their skills by playing as many as 52 games, SWC teams are playing 24. Winning under these circumstance is difficult for any SWC team in the NCAA tournament. In fact 3 of the 5 years the SWC team loses in two straight games in the tournament. College World Series Appearance- Texas loses the first two games and exits the tournament. Falks last year is a great one. Team wins the SWC, individual batting championship, and places 5 players on the All SWC team. His final record is 476 wins out of 652 games played. 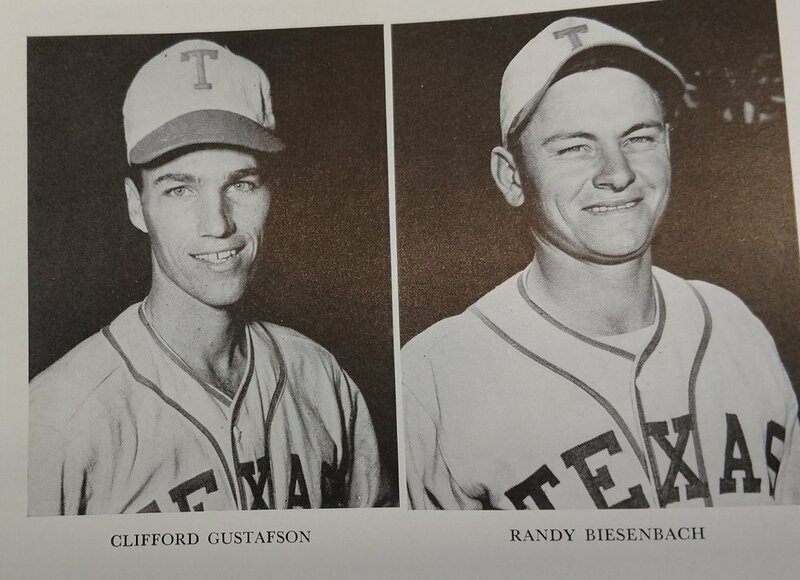 Texas string of scoring in a game ended at 199 games when a A & M pitcher shuts-out the Horns. 4 teams tie for SWC championship. The Longhorns win the Coin flip. Texas and Houston play the first indoor game in college baseball history at the Astrodome and the Horns play on AstroTurf for the first time. Gary Moore was the only Longhorn on the All SWC team. College World Series Appearance- beat Arizona but lost to St. Johns and Oklahoma State. Falk makes a plea to the SWC rules committee for Fall baseball games. He is rejected. Falk tells Jack Gallagher a sports writer in Houston that the lack of summer ball in Texas combined with SWC rules that did not allow Fall work-outs may result in the SWC never winning another national championship. The SWC was the only conference in the nation that restricted Fall work outs for the teams. January 1967 the professional baseball league agreed to not sign college athletes until "all or most of their eligibility had been completed." A record 4 consecutive home runs are hit against Baylor. SWC Champion but they lose to Houston in the district playoff. Coach Bibb Falk had a tough exterior but a great heart. Wayne McDonald and Bethea said that Bibb Falk was a great batting coach. He taught players how to adjust hands, shoulders, and hips until everything was just right. "That's alright son . As bad as you are, you may never get another hit, anyhow." "You can't make chicken salad out of chicken bleep." "You ain't gonna hit nuthin' that way..."
But under that tough veneer was a man who cared for all of his players and their success in baseball and life. Coach passed away on June 8th 1989 at the age of 90. Horns Up!!! Bibb Falk's contributions to Longhorn traditions represents a portal to the past that reminds Longhorn fans that heritage shapes the present and empowers the future.